You can hide any worksheet in a workbook to remove it from view. You can also hide the workbook window of a workbook to remove it from your workspace. The data in hidden worksheets and workbook windows is not visible, but it can still be referenced from other worksheets and workbooks. You can display hidden worksheets or workbook windows as needed. By default, all workbook that you open are displayed on the taskbar, but you can hide or display them on the taskbar as needed. Note: The screen shots in this article were taken in Excel 2016. If you have a different version your view might be slightly different, but unless otherwise noted, the functionality is the same. Select the worksheets that you want to hide. If you don't see the tab that you want, click the scrolling buttons to the left of the sheet tabs to display the tab, and then click the tab. Click the tab for the first sheet. Then hold down Shift while you click the tab for the last sheet that you want to select. Click the tab for the first sheet. Then hold down Ctrl while you click the tabs of the other sheets that you want to select. Right-click a sheet tab, and then click Select All Sheets on the shortcut menu. Tip When multiple worksheets are selected, [Group] appears in the title bar at the top of the worksheet. 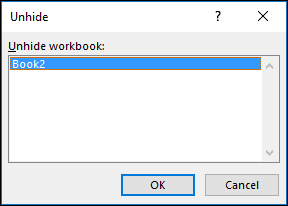 To cancel a selection of multiple worksheets in a workbook, click any unselected worksheet. If no unselected sheet is visible, right-click the tab of a selected sheet, and then click Ungroup Sheets on the shortcut menu. On the Home tab, in the Cells group, click Format > Visibility > Hide & Unhide > Hide Sheet. To unhide a worksheet, follow the same steps, but select Unhide. You'll be presented with a dialog box listing which sheets are hidden, so select the one you want to unhide. When you unhide a worksheet, you can only do so one at a time unless you use Visual Basic for Applications (VBA) code.. If worksheets are hidden by VBA code that assigns the property xlSheetVeryHidden, the Unhide command will not display those hidden sheets. If you are using a workbook that contains VBA code and you encounter problems with hidden worksheets, contact the workbook owner for more information. On the View tab, in the Window group, click Hide or Unhide. On a Mac, this is under the Window menu in the file menu above the ribbon. 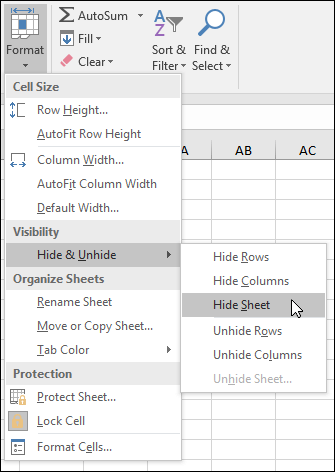 When you Unhide a worksheet, you can only do so one at a time, so select from the list of hidden sheets in the unhide dialog box. If Unhide is unavailable, the workbook does not contain hidden workbook windows. When you exit Excel, you will be asked if you want to save changes to the hidden workbook window. Click Yes if you want the workbook window to be hidden the next time that you open the workbook. Excel 2013 introduced the Single Document Interface, where each workbook opens in its own window. The following steps only apply to Excel 2007 and 2010 for Windows. 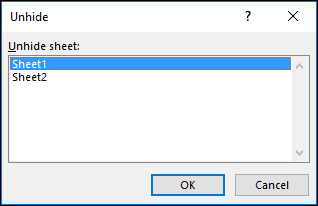 For Excel 2010, go to File > Options. For Excel 2007, click the Microsoft Office Button , then Excel Options. Then click Advanced > Display > clear or select the Show all windows in the Taskbar check box.